Studio Line: Disney - An immortal legend. As you've only imagined. Wild with exotic adventure and laughs, Disney's Tarzan is a magnificent adaptation of Edgar Rice Burroughs' classic story of the ape man! Raised by a family of gorillas, including the loving Kala and the wisecracking Terk, Tarzan develops all the instincts and prowess of a jungle animal. But with the sudden appearance of Tarzan's own kind, including the beautiful Jane, two very different worlds are about to become one. Driven by five powerful songs from pop superstar Phil Collins, and starring the voice talents of Minnie Driver, Glenn Close and Rosie O'Donnell, Disney's Tarzan delivers incredible adventure as well as important reminders about acceptance and family! Academy Awards: Won for Best Song-"You'll Be In My Heart," 2000. Box Office: Budget: $150 million. Opening Weekend: $34.361 million. Gross: $171.085 million. DVD: Widescreen 1.66:1/16x9; audio English DD 5.0, French & Spanish Dolby Surround; THX; subtitles Spanish; closed-captioned; single side - dual layer; 26 chapters; rated G; 88 min. ; $34.99; street date 2/1/00. Supplements: Interactive Games, Music Videos, Theatrical Trailer, DVD-ROM Features. 1999's Tarzan established once again that Disney really could have a huge hit with an animated film not created by Pixar. Since the enormous success of The Lion King in 1994, Disney's animated films had been essentially treading water prior to Tarzan, with the exceptions of Pixar offerings Toy Story in 1995 and A Bug's Life in 1998. Without those hits, Disney's animated pictures were stuck in a rut; the movies made between roughly $100 million (actually, low-water mark Hercules in 1997 was a tad under that total) and $141 million (1995's Pocahontas). That ain't chicken feed, but after the ecstatic $312 million highs of The Lion King - and the raised expectations that came with that hit - these other totals didn't quite cut it. Which was a shame, because some of those movies were quite good. I really liked 1996's Hunchback of Notre Dame, which seemed surprisingly daring and dark, and although I didn't initially care for either Pocahontas or Hercules, I've come to appreciate and enjoy both of them in the interim. Since I am a big fan of Disney animated films, I was happy to see the success of Tarzan with its $170 million take. That's not because I care about how much money the studio makes; no, I take an interest in how these movies fare because I fear that if they continued to perform below expectations, Disney may savage their animation department and we'd cease to see the unprecedented output that the 1990s witnessed. Consider this: Disney released a traditionally-animated film every year during that decade except for 1993. In no other decade did they produce so many full-length movies (and that doesn't even factor in the three Pixar efforts, two stop-motion features, and traditional but cheap programs like The Goofy Movie). So my interest in the success of Tarzan related to more than just a desire to see a good movie. Not that any of this negates the fact that Tarzan indeed is a strong effort. The film does nothing particularly new or fresh; we get the usual adventures and the usual kooky sidekicks and the usual love interest and the usual menacing villain. Actually, the movie bears more than a passing resemblance to Pocahontas in that both films show greedy white dudes who want to exploit the natural resources - and inhabitants - of a mysterious (to them) new territory, and we also see the wonders of those lands come to life through the eyes of some more open-minded (and romantically-appealing) visitors. Despite those similarities, Tarzan in no way feels like Pocahontas, which was much more somber and serious. Tarzan has some moments of definite drama - quite a few of them, really - but it tends to stay more light-hearted than Pocahontas. I think that's because it actually shows a viability to the lifestyles lived by both Tarzan and Jane - we see the positives and negatives of each person's background - whereas in the older film we are hit over the hit with the (supposed) superiority of Pocahontas' culture. I found this lack of obsessive political correctness to be a relief. Ultimately I feel that while Tarzan shows Disney as they do what Disney does best, it's not the best Disney's done. As a film, it's hard to find real faults, but it's also difficult to discern special pleasures. The movie offers a more kinetic animation experience than usual - Tarzan really flies about that jungle! - but little otherwise sets the film apart from other pictures. This means that our main characters are strong, but not extremely compelling or memorable. Tony Goldwyn and Minnie Driver do a nice job as Tarzan and Jane (respectively), but not anything more than that. Brian Blessed is fine as underdeveloped villain Clayton - it's hard to believe Blessed's the same guy who voiced Boss Nass in The Phantom Menace - but the thinness of the character is an issue. Glenn Close and Lance Henriksen are also very good as Tarzan's de facto parents, but I just can't say that I found them to be very memorable. Perhaps the most amazing aspect of Tarzan as it relates to vocal performances comes from the fact that Rosie O'Donnell's work as Tarzan's gorilla buddy Terk didn't make me want to kill myself (or anyone else, for that matter). I used to like O'Donnell, but just like Jay Leno, once she got a talk show she became completely insufferable, so I feared her presence in Tarzan would ruin it. Happily, that's not the case. While I can't say I liked her performance, it generally seems unobtrusive and doesn't have much of an affect on the film either way. That's a victory, I suppose. Hmm... I'm starting to suspect that my comments about Tarzan may indicate a dislike of the film, but that's not the case. Overall I find it to be exciting, funny and enjoyable, and it continues a long line of very fine Disney animated films. My reserved tone comes from the high expectations with which I tend to greet these releases, and the fact that I just don't think Tarzan matches up with Disney's best efforts. It's a firmly middle-of-the-pack offering from them, which still tops almost every animated film from studios not named Disney. 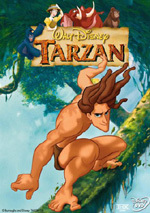 Tarzan appears in its original theatrical aspect ratio of 1.66:1 on this single-sided, dual-layered DVD; the image has been enhanced for 16X9 televisions. If you're hoping to find some flaws with the picture, good luck; I couldn't. Sharpness looks absolutely immaculate from start to finish; I never noticed the slightest amount of softness or haziness at any point. Moir� effects and jagged edges are also blissfully absent, and the print itself appears perfectly clean and smooth; I saw no signs of grain, speckles, scratches, nicks, hairs or other defects. Colors are absolutely wondrous, and they display fabulous depth, clarity, and vivacity. Black levels seem deep and rich, and shadow detail looks appropriately heavy but not too thick. How good is this picture? I came very, very close to awarding it an "A+", and I don't do that very often. Impressive but flawed is Tarzan's Dolby Digital 5.0 soundtrack. The audio problems have been well-documented elsewhere, but I'll offer a quick recap. Essentially, much of the information that should come solely from the rear left channel also appears in the front left speaker. This creates a muddled effect on the left side of the spectrum, since the spatial definition often seems weak; we hear a fair amount of information that comes (appropriately) from just the front left, but too much gets stuck in auditory limbo between the two left speakers; it's not a fatal flaw, but it's bad enough that it caused me to significantly lower my grade for the sound. Were it not for the flawed mastering, the audio would rate a very high grade; in all other respects, it's an excellent mix. The soundfield seems very engulfing and active, with a nicely-spatial image that offers well-placed sounds (except for that left side, of course). The rears provide a high level of information and are very active participants in the mix. Sound quality seems excellent. Dialogue is consistently clear and natural; it seems well-integrated with the image, something that's not always easy to do in animation. The music seems pretty smooth and well-rounded, though Phil Collins' songs occasionally appear to have too much of a reverb effect; how much of this occurs due to the audio error is unknown. Effects are realistic and detailed, with some very good bass at times. Oh, that reminds me of another controversial issue about the Tarzan DVD. As you may have noticed, this isn't a 5.1 mix; it's 5.0, which means that no dedicated subwoofer channel exists. While the other audio issue clearly regards an error, as of yet there seems to be no consensus whether or not Disney messed up by not including that ".1" channel. Some folks say that it represents the original audio accurately, some say we lose bass because there's not enough sub action occurring. I'll skip opining on this one, because I really don't know which position is correct; all I can say is that the audio seemed pretty deep on my subwoofer-less system. Although Disney saved all the real goodies for the Collector's Edition release of Tarzan, this more bare-bones package actually includes more supplements than we typically find in a Disney animated DVD. We get a somewhat dull music video for Phil Collins' "Stranger Like Me" plus some brief behind the scenes footage of the recording of "Trashin' the Camp" with Collins and 'N-Sync. That piece lasts about two minutes and is not terribly compelling unless you're just nuts about them teeny-bopper boy bands! Two more features round out the package. There's an "interactive trivia game" which presents 15 questions of varying difficulty, some of which are rather tough! It's nothing special but it's a little fun. There's also an "interactive read-along", which is basically a storybook with colorful art that's been put on the video. Obviously meant for wee ones, kids can either read the text on their own or have it read to them and they then follow along with it. It doesn't do anything for me, but it's a nice little touch, and one that will become more common; Columbia-Tristar's Stuart Little features a similar feature, and it looks like all future Disney animated DVDs will have them as well. Tarzan started the questionable trend we now find on some Disney DVDs: a slew of advertisements that appear prior to the main menu. The DVD starts with the usual copyright warning, and then it launches immediately into commercials for the video releases of An Extremely Goofy Movie, The Fox and the Hound, Toy Story 2 plus pitches for the Tarzan computer software and for a Disney Internet site. I don't particularly mind these ads; they offer some potentially interesting information and my Panasonic players allow me to quickly and easily skip them through the "chapter skip" button. However, many others detest these trailers; some feel that way just due to the principle of the thing, whereas others have had a trouble bypassing the commercials as easily as I could do so. It appears some DVD players have more difficulty with them than others, though I haven't heard of any concrete trends that indicate any particular models that all refuse to advance. Whether these ads are a serious negative or just a mild nuisance is up to you, but be warned that they're there. Despite that annoyance, Tarzan stands as a pretty good DVD. The movie itself isn't quite among the best Disney has to offer, but it's still fast-paced, well-made and very enjoyable. The DVD itself presents an absolutely visual image, but the sound falters due to a much-publicized error. The supplements are acceptable but weak. Ultimately, I think Tarzan belongs in your DVD collection, but I'd have to recommend you skip this release. The Collector's Edition will arrive very soon - I'm writing this ten days before its release date - and provides everything found on this version plus a boatload of extra supplements and it comes with a list price only $5 higher than this one ($39.99 versus $34.99). Also, one certainly hopes that the audio error found on this DVD will not mar the new release, though we won't know for sure until it arrives. If you really don't care about supplements and can find the movie-only edition of Tarzan for very little money - I'd say $15 or less - then you may want to purchase it, especially if you lack a sound system that would make apparent the audio flaws (it won't be noticeable if you lack rear speakers). For everyone else, it looks like the Collector's Edition is the way to go.